From its high vantage point, the hotel offers panoramic and stunning views over the town and of the surrounding mountains. Well-equipped accommodation combine with a restaurant, indoor swimming pool, spa facilitity and the stunning view to create a perfect spot for relaxation. In all, the hotel offers 43 guest rooms and suites, accommodating from two to six persons, depending on room type. There are nine standard double rooms for two persons each, plus 17 junior suites with two rooms and a sleep sofa. Eight luxury suites are similarly set up, and have sleep sofa in the living room. In addition, there are seven standard maisonettes for four persons, plus two two-bedroom maisonettes for up to six persons. Room amenities include air conditioning and heating, two telephone lines, color satellite television, and private bath with hairdryer. All rooms have veranda with excellent view. The luxury suites have television in both living room and bedroom, plus a working desk. The hotel has both a restaurant and a cafe, with indoor and outdoor seating, plus a bar and piano lounge. There is also an indoor swimming pool and a spa facilitiy with heated hydro-massage pool, steam, sauna, showers, massage, and a fitness room. 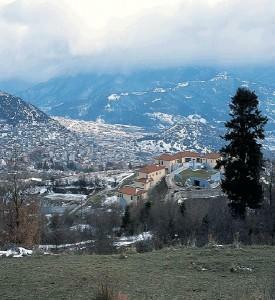 Avaris hotel is situated in Karpenisi, at an altitude of 1200 meters, overlooking the town and the mountains.